US stock markets rallied late on Thursday to end in positive territory, continuing their roller coaster ride towards the end of the year. In Asia, most markets were following suit except Japan's Nikkei 225, which was down 0.5% in Friday morning trade. Markets have been volatile as global, political and economic uncertainty continues to haunt investors. The Dow Jones - which fell by more than 500 points or 1.8% earlier on Thursday - finished the trading day 1.1% up. The S&P 500 and tech-heavy Nasdaq also rallied by the end of the Thursday's trading day. The S&P 500 had fallen by 48 points or 2% at one point, while the Nasdaq also sank by more than 2% or 135.4 points. The earlier sell-off was sparked by weak US consumer confidence data for December. However, analysts had cautioned that volatile share price movements were exacerbated by thin holiday trading. 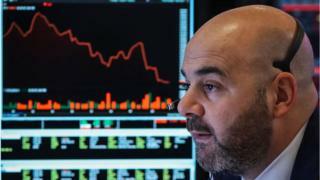 London's FTSE 100 slid as the day progressed, ending 1.5% down, with UK shares at their lowest in over two years. Frankfurt's Dax was 2.8% lower, while the Cac 40 in Paris suffered a smaller fall, down just 1.1%.